Abby Webster works hard as a waitress, tackling twelve-hour shifts at the Buttered Biscuit to support her four-year-old daughter Lila. Lila’s activities may be restricted by spinal bifida, but there are no restrictions on her heart and spirit. Lila embraces life with joy, but life has conditioned Abby to count on no one but herself. She grew up as a foster child who always remained an outsider, and Lila’s father abandoned Abby and their baby as soon as he learned that the infant would be a special-needs child. Devoted to her daughter and possessed of a fierce pride, Abby cannot accept charity no matter how much she longs for a better home or how susceptible she is to Brady whose heart is as big as his super-hero-size body. Brady is persistent, and so are Lila’s needs. When Abby trips on a broken board and almost falls with Lila, she relents and accepts the makeover offer. Soon she is falling in love with Brady and with all his big, loving, exuberant family. The God they worship seems very different from the judgmental deity waiting to zap her for her mistakes that has been Abby’s concept of God. But can she trust her heart and can she trust Brady not to become just one more person who leaves her? Goodnight’s new Christmas book is warm with family, faith, and charity in the fullest, most active sense of the word. A bestseller and RITA-winner, Goodnight is deft at creating characters who capture her readers’ interest and affection. 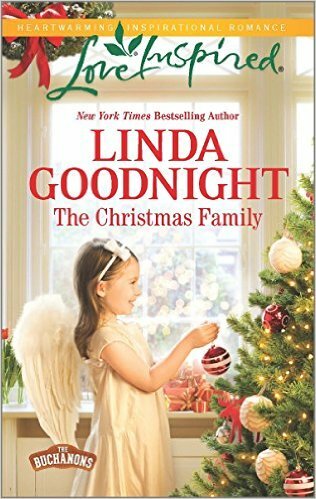 Abby and Brady are likeable but credibly imperfect characters, and Lila is a heart-stealer. The Buchanon family is large, varied, tightly knit, and faith-filled, but there are tensions and problems enough to keep them believable. My only quibble is that if you have not read Cowboy under the Mistletoe (2014), you will be aware that you are missing bits of the family’s story. I also wonder if we will have to wait until next fall for the next book in the series. Nevertheless, if you like Christmas Inspys, this one is a treat. I will take your advice to read Cowboy Under The Mistletoe first.